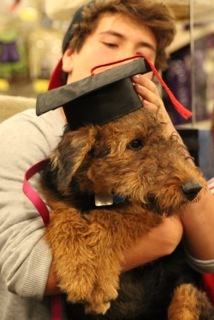 After six weeks of dogged course work, lead exercises and plenty of pet persuasion, Arya the Airedale Terrier has graduated from K-9 College, aka PetSmart, Calgary. Alongside her fellow students, Biggy, Niha and Maya, she made it through thanks to some splendid direction from PetSmart Training Instructor, Jenny. Sitting, as well as some good lie-downs and even shaking paws, are now possible, although “come-when-called” and loose lead walking still need attention.